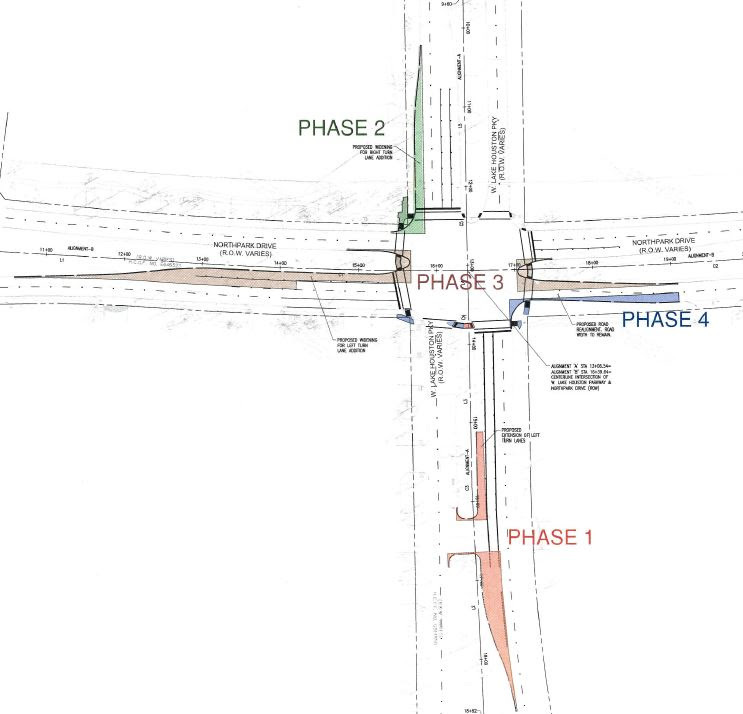 The Lake Houston Tax Increment Reinvestment Zone (TIRZ 10) will be conducting intersection improvements at Northpark Drive and West Lake Houston Parkway beginning, Monday, October 30. The work will be conducted in four phases which will be completed in Spring 2018. Construction at this location will include an extension of the left turn lanes of West Lake Houston Parkway heading northbound to turn on to westbound Northpark Drive (phase 1), a new designated right turn lane from southbound West Lake Houston Parkway to westbound Northpark Drive (phase 2), a new designated right turn lane on eastbound Northpark Drive to southbound West Lake Houston Parkway (phase 3), and the realignment of Northpark Drive just east of the intersection to improve traffic movements through the intersection (phase 4). See phases shown in diagram below. The crews will work between the hours of 9:00 a.m. and 5:00 p.m., Monday through Friday. Work may also be conducted on Saturdays in the event of inclement weather. At least one lane will remain open at all times in each direction. However, intermittent delays are expected during construction. As a result, Council Member Martin has alerted the Houston Police Department's Kingwood Substation and has asked that officers help with traffic mitigation when possible. Additionally, traffic control measures will be in place on site including traffic barrels, traffic cones, directional signage and flagmen.